While it is one of the most unique attractions on the planet, Jellyfish Lake is no longer the only stage in which these fascinating creatures dance for an audience. As a matter of fact, there are several museums throughout North America that are now featuring Jellyfish displays, including such prestigious aquariums as California’s Monterey Bay Aquarium; Florida’s Key West Aquarium; and Chicago’s Shedd Aquairum; to name just a few. So, for those that can’t travel to one of the world’s most renowned underwater destinations to enjoy the virtues of swimming/snorkeling up close and personal with Palau’s golden jellyfish (known as Mastigias) and the moon jellyfish (known as Aurelia), “arm chair travelers” can revel in sensational museum exhibits closer to home. Just Google search “Jellyfish Exhibits” and find an underwater adventure awaiting, close to home. However, for those that do have the means to travel to one of the “seven underwater wonders of the world,” Palau has many virtues to make the journey worthwhile. 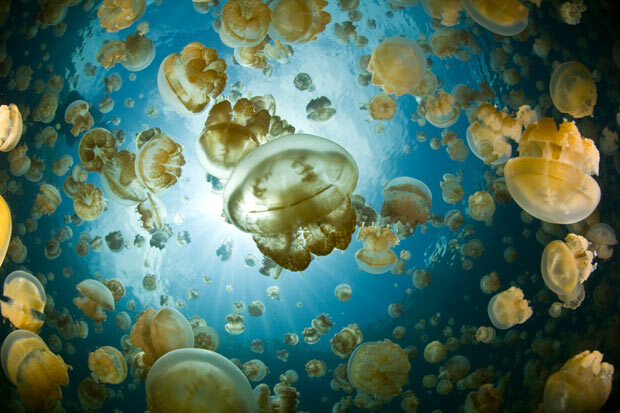 In addition to boasting the popular Jellyfish Lake experience, Palau is known as Jacques Cousteau’s favorite scuba diving destination; became the world’s first shark sanctuary in 2009; features air-, land- and water- based activities that include everything from helicopter tours, eco-adventure zipline course, ATV excursions, World War II history expeditions, Coral Reef Center and waterfall hikes to jungle river boat journeys, kayaking, snorkeling, deep-sea fishing, dolphin encounters and nature’s own Milky Way “spa” nestled in the iconic Rock Islands.